This post was written by Christi Robertson, a 4th grade teacher at Stoneridge Elementary School (@rcsdstoneridge). You can follow her on twitter @RobWolfpack. Choice. This idea can make even the most simple daily tasks frustrating. I am crippled by choice. Whether it’s where my best buddies and I want to meet up for our dinner dates or even as ridiculous as my family asking what’s for dinner. I am so fearful of choice, that my husband had to choose our wedding colors (I’m not joking). Google search quotes for choice. As if my own fear wasn’t disabling enough, I now see quotes such as, “You are free to choose, but you are not free from the consequence of your choice” or even, “The choices you make in your life will make your life. Choose wisely.” I don’t need to wonder for long as to why it is that I can’t make a choice. I have come to believe its roots lie in my not wanting to make a “wrong” decision. When I finally do make a choice, that’s when the real chaos begins. Is this a “wise” choice? Will it negatively affect my life forever? Are people going to hate my choice? When did the fear begin? I’m not entirely sure, but I do have some guesses. My goal is to make sure the students in my classroom, as well as my own two kiddos, will not be crippled by their own decision making, as I am. Let’s start with the word choice. 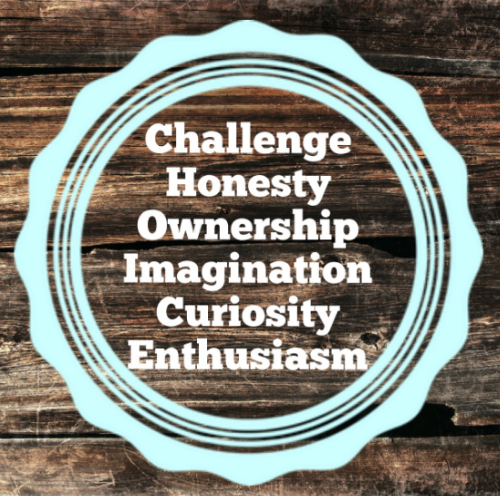 Six little letters that hold the key to my future happiness (according to several motivational posters hanging in many classrooms). Although the quotes are meant to enlighten our students, have we really taught them how to make choices? When I was in school, there were always right and wrong answers. Things were laid out in a specific format and our choices were limited. We were given an assignment, report, etc, and told how to do it. We were given the set of requirements, and a detailed description of the consequences of not following the requirements. Was I given a choice? Of course I was. It was to complete the assignment according to the guidelines or to not complete the assignment (okay, so really not much of a choice). Was this teaching me “how” to make choices? Are we, as teachers, really satisfied with this being the only opportunity for “choice” that we expose to our own students? I have decided that I am not. When I look closer at this word, I see ideas stemming from its make up. I now see how this word is meant to be a foundational skill, nurtured and cultivated through multiple exposures. When we give students opportunity for choice, we build their ability to: Challenge themselves to be independent thinkers, be Honest about their understanding of the subject matter, take Ownership for their own learning, push their Imagination, develop their natural Curiosity, and show Enthusiasm for their new learning. I believe that if we begin teaching our students HOW to make choices in a safe environment, we then are leading them to “choose wisely,” thus limiting the crippling fear that comes from making choices. Are we challenging our students to be independent thinkers? Are we challenging them in their understanding of the content that they are learning? I find that when WE create the guidelines and specifics of the project, assessment, or assignment, instead of challenging students in the classroom, WE are limiting their understanding by not providing them choice. When we provide an opportunity for our students to choose how they want to show their learning, we no longer need to worry about meeting the needs of every student by designing something ourselves. Choice provides a natural differentiation for each and every student. Our job now is to be there to guide them through the decision-making process. More opportunities for choice in the classroom allows students to challenge their own potential, to think outside of the box, and to push the limits that may have existed by our own limited ideas of what they can or cannot do. Are we limiting the challenges of our students by not providing choice, or are we allowing them to challenge the limits through making choices? Students sharing the pattern that they came up with in our math challenges. Are the assessments we are providing students an honest example of their understanding of the standards? I can remember studying for tests as a student and being worried about getting the answers wrong. I vividly remember making notecards, rewriting my already meticulously written notes, repeating ideas in my head, so that I would be able to answer the test questions correctly. If you were to ask me today to take those same tests, chances are, I would fail. Let’s be honest, I would fail miserably. I also recall an assessment that I took in college that provided an opportunity for choice. My First Aid and CPR class at Westmont provided my first honest assessment and gave an opportunity for choice. Our final was a hands-on simulation. We began by waiting in a room and being called out for an “accident” that had taken place on campus. As we rounded the corner, my partner and I were faced with a car that had “crashed” into a tree. The driver was unconscious and the passenger had also sustained severe injuries. My partner and I had to make choices based on what we had learned to “save” the lives of the victims. How do I know that this assessment, with many opportunities to make choices, was honest? I later became an athletic trainer at the school and followed that up with working for the Portland Trailblazers as a trainer. When students are provided choices in projects or assessments, we are given an honest look into their understanding and their capabilities. We are able to see the honesty they bring from their experiences and schema. Choice also allows me to be honest about the proficiency of my students. Students choose how they want show remainders. In the book, “Beyond Basketball” by Coach Mike Krzyzewski (Duke Men’s Basketball Coach (basically, my idol)), he tells the story of his working-class mother coming home for her job in Chicago. When she got off the bus, she was attacked by three teenage boys who were trying to steal her purse. She hung on to her purse with everything she had. When the boys realized that she was not giving up her purse, they ran off. When asked why she didn’t just give them the purse, she said because it was hers. Do you feel that your students are hanging on to their learning with a vice grip because it is theirs? Are we giving them the opportunity of choice to own their learning so that they will? Some examples of student choices for their Mission projects. Imagination knows no limits. It pushes what “we know” into what “can be possible.” It’s what drives our passions. It pushes our boundaries. Where are we giving our students the choice to use their imagination in the classroom? Coach K says, “Imagination gives you destination.” Do our students possibly already possess the tools necessary to be who they will become? How will we know if we never give them the choice to use their imagination to explore their potential? Students presenting their Genius Hour Projects to Mr. Blom that they chose would improve our already amazing school. Curiosity, to me, is the cousin of imagination. “Curiosity is the spark behind the spark of every great idea. The future belongs to the curious.” If we are leading our future, are we allowing them to show their curiosity through choice? Are we giving them a safe place to be curious, and cultivate their curiosity with guidance and support? Curiosity leads to a child’s investment of their learning. Giving students a choice to invest in their curiosity invites uniqueness and therefore, provides a natural differentiation in their learning. Dorothy Parker says, “The cure for boredom is curiosity. There is no cure for curiosity.” Let’s give our students the opportunity to take risks and be curious. Teach them to not be afraid, to try new things, to question the world around them, and turn those ideas inside out through choice. Students created a “Biome Museum” to share what they learned about their favorite biome. Have you ever found yourself exhausted at the end of the day from feeling like you need to show enthusiasm in everything you teach? Case in point: There I am, teaching static electricity, with an excitement that matches the last few seconds of a nail-bitter at Cameron Indoor Stadium, as if they are one in the same. I chant. I shout. I throw my hands around with wild abandon. As I end my lesson with, what I refer to as, “the grand finale,” I look across my room for those big eyes, wide with equal excitement. Instead, I find one student using their personal pencil sharpener as a shot glass (no joke), sitting next to a kiddo half asleep. In hopes that the third time’s the charm, I look to one more student, hoping that they were with me, only to find them attempting to hide a novel they are reading underneath their desk. At this moment, the buzzer in my head sounds, and even with all of my excitement for a win, Duke loses (and therefore, my lesson is a complete bust). Did I lack the appropriate amount of enthusiasm? As I wipe my damp brow, defeated from the effort required to make static electricity as interesting as possible, I conclude that it must be that I didn’t bring my full effort in this. I feel defeated thinking the hours of preparation did not meet my desired expectation. You see, static electricity is not what excites me, yet I feel the pressure to bring the enthusiasm for the students I teach. When was the last time I was excited? I can tell you when it was. It was just today. It was watching my husband coach my kiddos in their basketball games. Even though I was tired from a long week of teaching, and the Advil I had taken in the morning to ease the back pain I was in wasn’t working, it didn’t hinder my enthusiasm. I cheered, I shouted positive praise, I even kept detailed notes in my head of great moments my kiddos had on the court to share with them later. My enthusiasm for this experience was not hindered by the “problems” I brought with me to the event. If we give our students the opportunity to make choices in their learning or output, there is a chance that the ever so popular bathroom trip, might not be as interesting as what they are learning or working on. Think about a time when you have been told what to do and how to do it. Maybe it was that last staff meeting, where your principal gave the new requirements handed down by the district office (not my principal, of course). How did you feel about it? Was it so exciting and you jumped on the opportunity to get started? If you’re anything like me, chances are, you rolled your eyes, and thought of 5,000 other things you could do that were more important than what was expected of you. Are we putting our students in this same predicament with their learning? Students created a miniature golf course using any materials they wanted. In no way am I saying that I have any or all of the answers on how to provide choice in your classroom. My goal is for all of us to create together a chance for our students to live a life that allows them to feel confident in the choices they will be forced to make. Let’s motivate ourselves to inspire our students through choice. Let’s teach them how to choose. Let’s let them: be Challenged, be Honest, Own, be Imaginative, Curious, and Enthusiastic about their learning. I challenge all of us to create a collaborative movement where we share the choices we are giving our students, because they deserve it. Let’s call it #choice. Thank you for sharing a window into your classroom. I loved the examples of how you provide choice. Keep blogging! !